Babies and Dogs and Bears, Oh My! Thirty-two years ago, on a beautiful spring afternoon, Joel and I brought our infant son, Seth, to visit his great-grandfather Jack in his Brookline apartment. Not long after we arrived, Seth did what all babies do: he wet his diaper all the way through to Grandpa’s slacks. I have been thinking about that exchange recently. I now have the opportunity to be watered by my own grandson (although diaper technology has evolved to the point at which that situation has not yet occurred), and it is a wonder to be at that stage of life, and an absolute privilege to have a grandchild. If Max’s diaper needs to be changed, then I am happy to do it. When Rascal was alive, I never minded picking up after him. I adored that black lab and miss him every day. He really was a member of the family. I guess I believe that, like cooking on the grill, outdoor cleanup is best left to my husband. Which brings me to grilling. I am terrified of the propane tank, afraid it will explode in my face. I don’t particularly like the old charcoal grill, either, but am willing to cook on it because charcoal can’t detonate. Can it? All this makes me wonder: Have I flunked feminism? 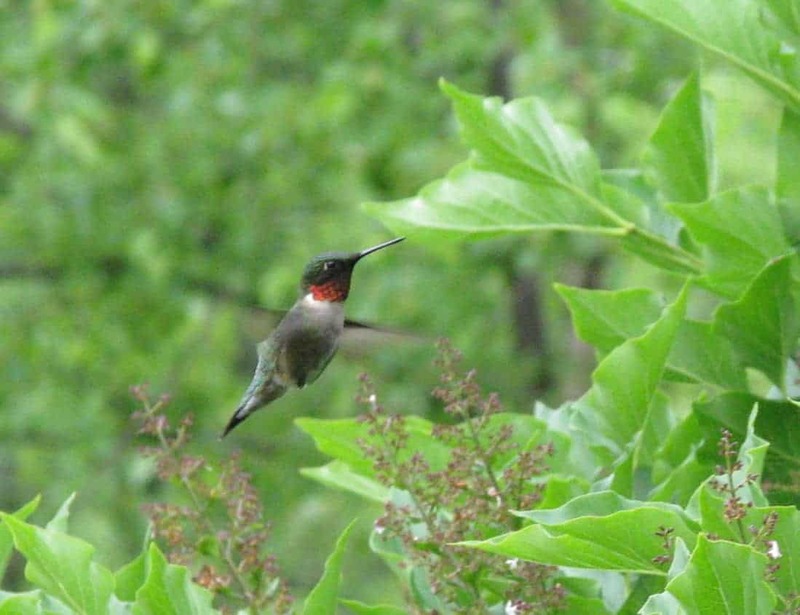 Like the swallows at Capistrano, the hummingbirds are back. In our case, it’s a family of three that has been coming to us for the past four years. First, some history: The local police chief informed us that having a regular bird feeder with seed was not a good idea, given the bears in our neck of the woods. In fact, a big news story at the time reported on a mother-cub duo that invaded the home of television personality Gene Shalit, just a few miles down the road. I first got interested in hummingbirds during a trip to Costa Rica. On return home I purchased a beautiful, sculpture-like feeder from a birding shop. As beautiful as the feeder was, it had two little test tubes that needed to be refilled every day — those tiny birds eat a lot to maintain their high-velocity wings. Then, of course, one of the test tubes broke and I couldn’t find one the right size – even on a website devoted solely to, yes, test tubes. Rather than continue to search for one little test tube and spend my days pouring nectar, I bought a standard feeder. You know the ones, the big glass tube with red trim and yellow plastic flowers. Tradition has it that the red is supposed to attract hummingbirds. (Of course, I also see the birds feeding at my pale lavender wisteria and white snap pea blossoms.) This new feeder can hold four cups of fluid and needs refilling only once every week or two. 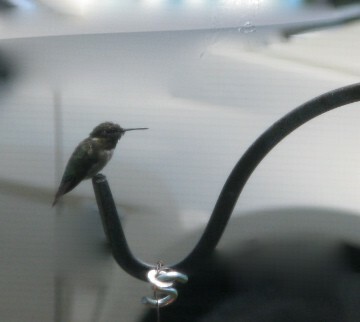 This particular feeder hangs from a wrought iron post directly outside the dining room window. We find ourselves staring at it as we eat, hoping to catch a glimpse of the rapid-flying beauties. Every ten minutes, like clockwork, a bird approaches the feeder for a snack. And, each bird is different. One has a red band around its neck, another a white breast, while a third is pale green. The birds move so fast that at first it was hard to see the differences among them, but with time we have come to know our feathered friends. Plus, with the help of the sports setting on my camera, and some patience, I have been able to capture some very good images of our summer guests. A couple photos are included with this post. The first three years we had the feeder, the birds zoomed in, took a sip, and zipped away. This year, they have begun to linger. Are they slowing down with age? Or, are they feeling more comfortable with us than when they first started coming to our yard? A few weeks ago I pulled into the driveway to discover the wrought iron post parallel to the ground, and the feeder emptied of all fluid. The previous night’s heavy rainstorm had affected nothing else – neither a twig nor a leaf was out of place — so I was surprised that this one thing had fallen. Until our neighbor Andy informed me that he saw a bear lumbering up our driveway. Apparently this bear had a sweet tooth. And we have a wildlife preserve. I am very glad that the hummingbirds can fly very fast.